We had our new year's feast about an hour ago. I like doing holiday meals around the 2-3 o'clock time. That way, I don't have to cook too many meals in one day and the big clean up is done earlier! 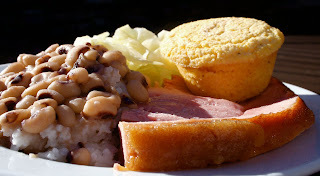 Our new year's feast was a maple brown sugar glazed ham, black eyed peas with rice, steamed cabbage and cornbread muffins. I feasted on black eyed peas, cabbage and two of those big fat cornbread muffins! YUM! So, lots of money and luck for me this year...bring it on 2010! I hope everyone is enjoying there day and that every one has a great year! I know you can buy glazed hams at the store, but I chose to not spend the $75 for that one and did my own. Besides, I could recognize all of the ingredients in my glaze! There is always something to be said for that. Preheat the oven to 325 degrees. Wrap ham in aluminum foil and bake according to package directions. Mix brown sugar through spices together in a microwave safe bowl and microwave for 1 minute. Stir and then microwave in 30 second intervals until all melted and gooey. 30 minutes before the ham is done, pour half of the glaze over the top of the ham. After 15 minutes, glaze with remainder of the glaze. Let rest for 20 minutes before serving.